Clifton Park - 16 Handles Frozen Yogurt Shop NOW OPEN! Clifton Park, NY - 16 Handles Frozen Yogurt Shop, a Manhattan based chain, has opened its first upstate store in Clifton Park at The Shops at Village Plaza. 16 Handles in Clifton Park, located behind Borders and a couple doors down from Moe's, has been open since March 27, 2011, and the franchise is locally owned by Melissa Salisbury from Schenectady, NY. Locals are already claiming to be instantly obsessed with this new frozen yogurt shop, but you may wonder.... what makes this chain different from so many others? Well, for one, it has Kosher-certified frozen yogurts, made fresh throughout the day. They also have very unique flavors, like Irish Mint, Green Tea, Cake Batter, Pistachio and a variety of others. Plus, you get to decide exactly how much frozen yogurt you want and pay by the ounce, not by some pre-determined size. There are always sixteen flavors 'on tap' (hence the name, '16 handles') and toppings for every delight and desire, with fresh fruit ranging from blueberries, raspberries and strawberries to kiwi, mango, papaya, pineapple and more.... as well as other fun toppings, including gummy bears, jelly beans, brownie bites, Fruity Pebbles, Cap'n Crunch, cookie dough, carob chips and cashews, to name a few. It's a great way to indulge your sweet tooth while enjoying a refreshing snack! "Streptococcus thermophilus, Lactobacillus bulgaricus and Lactobacillus acidophilus. They may not roll off your tongue. But once you've tasted our yogurt, your tongue will thank you. 16 Handles offers nonfat yogurts that are a good source of calcium and Probiotic cultures. Our frozen yogurts are hand crafted to contain high levels of beneficial live and active yogurt cultures - at least 100 million (108) cultures per gram at the time of manufacturer, if you want to get technical - that are never heat treated after culturing. All this attention to quality ensures that you receive all the healthy benefits of the living yogurt cultures in a creamy delicious frozen treat." 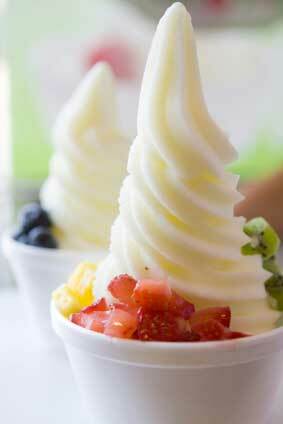 So get ready for spring, and enjoy the yummy, healthy and sweet choice of frozen yogurt in Clifton Park!